Human beings have tremendous difficulty with this concept, especially younger humans. Maturity could be defined as the ability to be selfless, recognizing that other people exist and have needs. From a certain perspective, that of the ever-expanding universe, one could argue that EVERY point of observation is the center. In light of this view, I'll rephrase my statement. The Earth is not the center of our solar system. There is a good amount of evidence to demonstrate this, but much of it deals with the complex mathematics of Kepler's Laws of Planetary Motion. 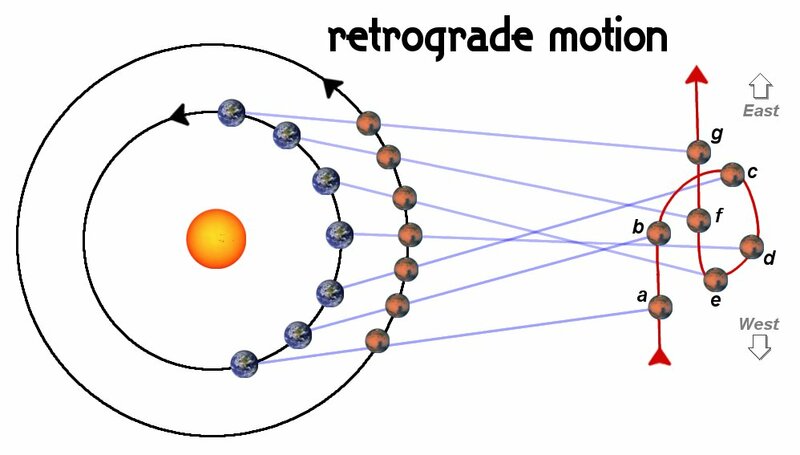 One way to show students that our planets orbit the sun instead of Earth is to talk about retrograde motion. 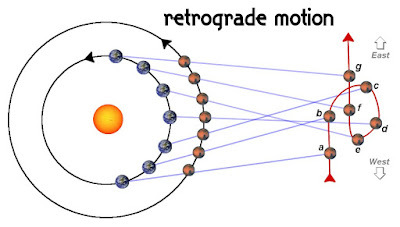 Retrograde motion is the apparent backwards motion of a planet when it passes, or is passed, by another planet in orbit. It made more sense to the students when I talked about a car going 70 mph passing one going 60 mph on the highway. While the slower car is still moving forward, it appears to move backwards from the perspective of the first car. Similarly, when movies use chest-mounted cameras that face towards the person wearing them, it appears as though the person is staying still while the world moves around them. After a brief conversation on retrograde motion, we watched a quick video on what it would be like if the Earth were flat. Shifting perspectives is VERY complicated, but can be incredibly fun and enlightening! A prime example of that is that I've been slowly shifting my own perspective to the mentality that I'm a teacher! The physics students were GOING to take their kinematics quiz on Thursday, but then I found that several will be gone for sportsball stuff, so I decided to give the quiz today. In an effort to counteract that, I let them work with a partner if they chose to. Each student had to turn in their own work, but they could discuss answers, strategies and ideas. Several students made excellent choices in terms of partners. All of the groups worked fairly well and the room was filled with quiet, accountable conversations. At the end of the period, only one pair of students had completed the assignment. Since they weren't goofing around, I let them take the quizzes home and finish them up tonight. One student asked if he, theoretically, went home and looked up the answers on Wolfram Alpha, would he still get the points. I told him that doing so would only cheat himself. I don't care about his grades. I care that he knows the material. A fake "A" will give him a false sense of understanding and will hurt him in the future. I don't really have any worries about this group cheating.